Badger phone in GTA IV, without the Badger logo. The mobile phone, also known as the cellphone and cell phone, is a recurring portable communication device that has been carried by protagonists in various Grand Theft Auto games. Prior to Grand Theft Auto IV, the phone was essentially cosmetic, and could not be used by the player to make calls at will; the functionality of mobile phones is greatly expanded in the HD Universe. In Grand Theft Auto 1, mobile phones technically function identically to pagers, delivering messages (often one-way) to the player at the bottom of the screen, representing verbal communication instead of the pager's text messages. Much like the pager, messages delivered via a mobile phone are displayed in text form beside the graphical representation of the phone. The mobile phone is also present in the Grand Theft Auto: London mission packs and functions identically to GTA 1's mobile phone, but is refashioned into a walkie-talkie as modern mobile phones were not available in the 1960s. The mobile phone in GTA 1. Spoken text is displayed to the right of its image. The mobile phone/walkie-talkie in GTA London, which relays message the same way as in GTA 1. Grand Theft Auto: Vice City marked a return of the mobile phone after being absent in Grand Theft Auto 2 and Grand Theft Auto III. The mobile phone's role remains unchanged as it is often used between missions and important events, but primarily complements face-to-face interactions between characters. Since GTA Vice City, players can choose to answer a ringing mobile phone; failing to answer a call will usually lead to the phone repeatedly ringing between a period of silence until the player answers it, or after the effects of not answering the phone is activated (i.e. A drop in the player's relationship with a girlfriend). During a verbal exchange on the phone, the player's mobility is reduced while the player holds the phone, being incapable of jumping, sprinting, or holding and shooting a weapon until the call ends. Players may also have the option to skip an in-between-mission phonecall. In GTA Vice City, Tommy Vercetti retrieves a phone from Leo Teal during "Back Alley Brawl", allowing him to receive calls from in-game characters about missions or other topics. The phone's design is based on early commercial mobile phones from the 1980s. In Grand Theft Auto: San Andreas, Carl Johnson has a phone which he uses to make and receive calls. Again, these may be about missions, they may relate to the general story, they may be tips from other characters, or they may serve no particular purpose — for example, the prank calls CJ receives from Catalina. The phone's design is that of an early flip-phone, with a small LCD display for numbers. In Grand Theft Auto: Liberty City Stories, Toni Cipriani retrieves a phone from a deceased Sindacco member in "Snuff". This phone is presumably the phone he uses from then on, as Toni originally called using a pay phone in "Home Sweet Home". The phone's function is similar to those in GTA Vice City and GTA San Andreas, but is depicted as a late-1990s clamshell phone. The mobile phone in GTA Vice City. The mobile phone in GTA San Andreas. Since GTA Vice City, the player has limited mobility while on the phone, only retaining the ability to run or walk. Players can also skip phone calls since GTA Vice City. The mobile phone as a pickup in GTA Liberty City Stories. customize the phone's ringtone and text size. The player can change the text size in the phone with the "Text Size" in the options menu; for the console versions of the game, this is only available if the resolution is set to 1080i. support for advanced polyphonic ringtones and animated phone's wallpapers (known as "themes" in the game). Themes and advanced ringtones of the phone can be purchased via a website on the in-game internet. Access to vipluxuryringtones.com is initially unavailable in GTA IV until the second model of the phone is acquired. In The Lost and Damned and The Ballad of Gay Tony, the player's phones are practically identical to Niko's second phone but with cosmetic changes. Johnny and Luis each have a unique theme for their phones; as Johnny's phone assumes a more hardy appearance with a black plastic/leather phonecase and has a unique "Lost MC" theme featuring The Lost Motorcycle Club's patch, while Luis Fernando Lopez' phone appears to be more high-end than Niko and Johnny's phones and is round, similar to Johnny's, and has a glowing blue keypad and a unique "Club" theme. As an exclusive feature in The Ballad of Gay Tony, the player can replay any of his accomplished missions via his phone in order to be able to get a better score on them. The mobile phone in GTA IV renders its screen and keypad into a display on the lower right of the screen; this is replicated on the "actual" phone Niko holds, as seen here. Johnny Klebitz' phone in The Lost and Damned. Luis Fernando Lopez' phone in The Ballad of Gay Tony. If the player has damaged a vehicle to the point where the engine won't start, the phone can be used to "jumpstart" it by calling any number or contact — the engine will spontaneously function again, although no damage will be repaired. For convenience's sake, one can cancel the phone call as soon as "Calling..." is seen on the phone's display — the engine comes back to life as soon as the call is initiated. In the console versions of the game, the phone can also be used as a kind of "super handbrake", to instantly stop any vehicle, no matter the speed. Initiating the camera while driving will instantly stop the car — the player can leave the phone open to the "Camera" menu option, and then press X (on PS3) or A (on Xbox 360) when they want to stop. This is presumably a bug, and was fixed in the PC version — activating the phone camera while driving on PC will merely change the game camera to the "hood cam" perspective, and activate the phone camera as normal. As this exploit requires a camera function, it can only be performed once the player has acquired the second model of phone. In the PS3 version, an additional option is available in the phone. It is a SIXAXIS tutorial that teaches the player on how to use the SIXAXIS controller in the game. Selecting SIXAXIS tutorial (disabled during missions or when having a wanted level) in the PS3 version will place the player at the runway of Francis International Airport. In the PC version, the Video Editor is an option in the phone which will prompt the player to leave gameplay when selected with all unsaved progress lost. The mobile phone concept is preserved in Grand Theft Auto V, but it will be used in a bit different way. The player won't be getting as many phone calls from friends as it was in GTA IV, since many features are moved onto the map in order to make it easier for players to find their way to some activities. The phone does, however also have some new functions, such as accessing the Internet and receiving in-game e-mails. The player can now save their progress at any time off-mission using the "Quick Save" option. The camera is linked to the Snapmatic app. Snapmatic can be used to save in-game screenshots to the player's Social Club account, and the player can also share in-game images with friends on Facebook and Twitter. In GTA San Andreas, if the player has dual pistols wielded and gets a phone call, CJ will pull out two phones. In GTA Vice City, Tommy's phone resembles a Motorola DynaTAC. 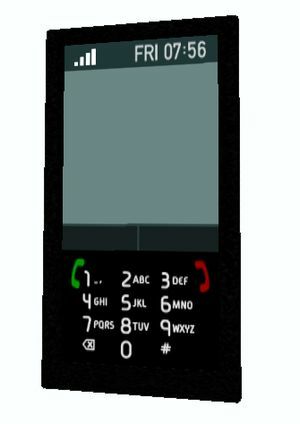 In GTA San Andreas, CJ's phone sort of resembles a Motorola MicroTAC with a green display (similar to Honolulu Cellular MicroTACs). In GTA Liberty City Stories, Toni's phone resembles a Motorola StarTAC. In GTA IV, Niko's phone sort of resembles a Sony Ericsson W302 without directional buttons. In The Lost and Damned, Johnny's phone nearly identical to Niko's phone, but given it comes covered in a phonecase, it looks more rounded than Niko Bellic's rectangular phone and the numbers on the keypad are more separated due to each number being on a separate button, whereas the numbers on Niko's phone use a "key strip" layout used on phones like the Motorola Razr. In The Ballad of Gay Tony Luis' phone resembles an HTC Desire, but with a traditional keypad instead of Desire's touchscreen. In GTA V, the mobile phones of the three playable protagonist's are based on different models, in the prologue, set in 2004, protagonist Michael De Santa used a Celltowa mobile phone instead of the iFruit as smartphones were not prevalent and the iFruit's real-life counterpart was not released until 2007. In 2013, Michael uses the iFruit smartphone as his current phone. Franklin Clinton, the second protagonist, uses a mobile phone that is a cross between a Samsung Galaxy phone with characteristics from BlackBerry with an interface based on the Android operating system. Trevor Philips, the third protagonist, uses a mobile phone modeled on the Nokia Lumia with a Windows Phone 8-style interface. In GTA IV the second model of the phone can be customized with themes and ringtones from websites. On the streets of the Liberty City random pedestrians will sometimes take out their phones to receive a call. If the player looks closely, pedestrians will have the same theme applied on their phones as the player. Advertisements of phones in GTA IV and its episodes depicts a battery meter on the phone, yet the phones the player uses never run out of battery. Phones in GTA V also have the same quirk. In GTA IV, the ringtone "Pager" comes from the Grand Theft Auto III's pager ringtone.